Jesus, in the establishment of his religion, did not force his followers to accept him. He taught every essential religious truth, made laws for their behavior, and spoke to them with persuasive words. He then left them to act freely, so the happiness of his disciples might be the reward of obedience, which flows from an enlightened mind and a teachable attitude. Our Master exhibited the clearest proof of a divine mission. By his life, he displayed the moral worth of his character. He called on his followers to examine his doctrines, to reflect on his works, and to weigh the actions of his life; and for themselves receive his words, obey his commands, and rely on his promises. Jesus recognized powers in us to judge the evidence on which his religion is founded, and to perceive that his instructions conformed to the unchangeable laws of truth. A number of important inferences may be drawn from this appeal of our Master to the human mind. 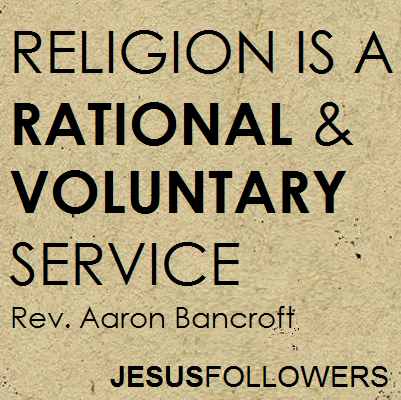 One is that religion is a rational and voluntary service. God has given us the attributes of reason and liberty. These make us the subject of a moral government, and make us capable of virtuous action. Take away these abilities, and we cease to be subject to reward or punishment. To make any course of action good, in a moral sense, an agent must be conscious of duty, and have the ability and power to do it. Actions in which the will of the agent have no place have no virtuous properties; and doing those actions cannot be called "moral." The way in which the human mind is used determines our moral character. Our actions create the morality of human conduct. Having the Reason to distinguish good from evil, and the liberty to choose the one and refuse the other, make us capable of moral conduct and moral self-government. If our freedom and agency is taken away, we are no better than animals, or we become like mere machines. 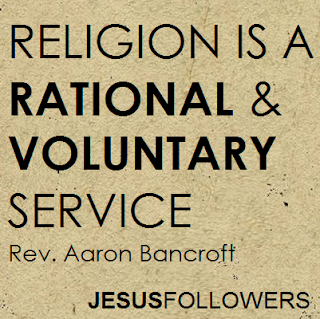 It is the duty of human beings to enlighten their minds about religion. To act rationally and freely in the important aspects of our faith, we must know its foundation, and learn its essential truths and duties. We cannot consistently perform the duties of religion, while ignorant of its first principles, any more than we can converse intelligibly in a language with which we are unacquainted. The Teachings of Jesus Call Us to ACTION!